Mrs. Bilgic started her career as specialist at T.C. 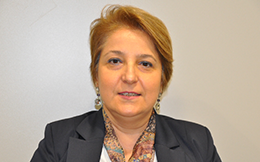 Ziraat Bankası A.S. Then, she worked as specialist at Borsa Istanbul A.S. during the period of 1996-2009 and as deputy manager between the period of 2009-2015. Currently, she works as deputy manager at “Public Disclosure Platform Operations Service” of Merkezi Kayıt Kurulusu A.S., the Central Securities Depository of Turkey. Her main areas of interest are public disclosure regulations and practices in capital markets, financial reporting, corporate governance, XBRL taxonomy development and electronic disclosure systems. She holds a Bachelor’s Degree from Department of Business Administration, Middle East Technical University (1992), Master’s Degree on International Finance, Amsterdam University (2006) and a PhD. Degree in Accounting and Finance, Marmara University (2013). Additionally, she has a certified public accountant certificate. Regulators all over the world are using the XBRL standard to ensure that they get the information that they need, when they need it, in ways that drive analytics and decision making. But what are the key steps to making that work?